November 9, 2003  Award-winning double-bassist and composer Edgar Meyer, 42, describes his music. October 2, 2009  The world of music seems to have fewer and fewer borders these days. 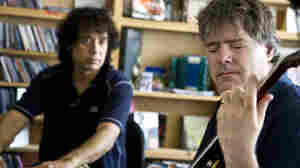 Bela Fleck, Edgar Meyer and Zakir Hussain are players who regularly cross over into new frontiers. Now, all three have collaborated on an album called The Melody of Rhythm. April 28, 2006  On a self-titled CD, Edgar Meyer plays all the instruments, overdubbing parts in his home studio. During a visit to Studio 4A, he offered a sampler on bass, banjo and gamba. And a sample the final result: "Please Don't Feed the Bear," from the CD Edgar Meyer. April 23, 2006  Composer Edgar Meyer's self-titled CD takes advantage of his many talents. Jacki Lyden visits Philadelphia's Curtis Institute of Music, where Meyer also finds time to teach, for a conversation with a musical master. September 6, 2004  NPR's Robert Siegel talks with banjo player Bela Fleck and bassist Edgar Meyer about their unusual musical collaboration. The two friends have collaborated in both bluegrass and classical music. They recently released a CD together, Music for Two. 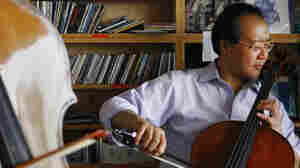 September 25, 2002  Robert Siegel talks with another "genius grant" winner: Edgar Meyer, a bassist and composer from Nashville, Tenn. Meyer fuses classical and bluegrass musical styles. (4:00) The music heard in this piece was, in order: "Bach's Unaccompanied Cello Suite," from Edgar Meyer's album, Bach: Unaccompanied Cello Suites, Nos. 1, 2, and 5 (Sony Classical, 2000); "Great Green Sea Snake" and "Smiles and Tears" from Meyer's album, Work In Progress. (MCA, 1990). July 26, 2010  Individually, Fleck, Meyer and Hussain are world-class masters of the banjo, the bass fiddle and the tabla, respectively. Playing together in the offices of NPR Music, the three demonstrate the way musical mastery can be transformed into an exercise in wordless communication. 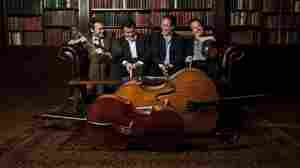 November 17, 2011  The genre-bending cellist heads a dream team of string players in music that borrows from bluegrass. November 21, 2011  The world-renowned cellist's latest Americana exploration features his collaborations with Chris Thile, Edgar Meyer and Stuart Duncan. 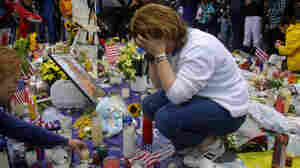 September 8, 2011  As NPR covered the events of Sept. 11, it was music that gave listeners time to reflect; to digest the images and the impact. Hear some of the songs we played 10 years ago in the days following the attacks.